This book is about this girl that meets a wounded fire horse. She cures the injured horse and dreams to be a vet one day. But it's not easy. Her father, a journalist, writes about woman that should stay home and do housework. Will she ever become a vet? Read the book to find out! I got this at my book fair for $1.00. I love, love, loved this book. I couldn't put it down and finished it really fast. I really do know how Rachel feels. I had to sell my horse derby. I totally recommend this. I haven't read this book yet but I want read it. I've read the book many times. Soooo amazing perfect for horse lovers. I have trouble finding horse books that, 1) aren't for little girls and 2) aren't all about guy/girl relationships with a tiny bit about horses. Well, this is it! It's an exciting book that doesn't get boring or go into too much history about the Great Boston Fire, and it kept my interest from the first to the last page! Rachel learns to gallop headlong into her own path instead of following the ones already planned out for her by her parents and society. A great read - recommend for anyone (however there are a few swear words and one REALLY bad one, so not good for younger girls to read to themselves). This book is one of my favorites! it is such a great story about being yourself and finding your courage. I also love the fact that it is centered around horses and has a lot to do with veterinary science. You have to read this book! When fifteen year-old Rachel is forced to move to Boston in the year 1872, she is furious. She is also lonely, for her beloved horse, Peaches, has been sold. 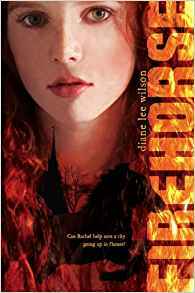 But Rachel soon finds a horse that needs her, and needs her desperately: The Governor's Girl, a famous firehorse, has been badly burned. Rachel gets permission to care for the Girl in a stable behind her house. As she cares for the girl, Rachel dreams about becoming a veterinarian. But her father, a newspaperman, has very definite ideas about where women belong: only in the home. Father also has definite ideas about Boston's inadequate firefighting equipment, as an outbreak of suspicious fires erupts. To make things worse, horses everywhere begin falling ill with distemper. -- and it is horses that power the city's fire engines. Another spark might send the whole city up in flames. When 15-year old Rachel wants to be a vet, no one allows her. Her beautiful horse, Peaches, was sold, and she's moving to Boston. Rachel's parents want her to act like a lady, and so many changes happen in so little time, and suddenly she finds a horse needs her. It is a famous firehorse named the Governor's Girl, and she's been badly burned. But not only that, fires erupt everywhere, and many horses are falling ill. What can Rachel do? Cool book a bit sad but i think it's cool that the horse got better.